Okay, so I have a bone to pick with this popular image. "While the rational position on a topic is often between two extremes, this cannot be assumed without actually considering the evidence. Sometimes the extreme position is actually the correct one, and sometimes the entire spectrum of belief is wrong, and truth exists in an orthogonal direction that hasn't yet been considered." Philosophically speaking this is where the problem of finding a true source on political matters is problematic. Rhetorically, which is where I live, the problem with this chart is that it plays into a commonly held belief that all sources are motivated through a hidden agenda. Further, you can expose this hidden agenda and reject any reason given for supporting any given source or story as merely something deployed to cover up the agenda underneath it all. This leaves one with a conclusion that the way out of this mess is to fall into the fallacy explained above or merely pick the agenda you like best and devote yourself to that agenda. Wayne Booth wrote about this decades ago. He called it motivism: the belief that we can abandon reason because we can see the true agenda underneath it all. Reasons, he would say, are understood only as something deployed to hide motives. 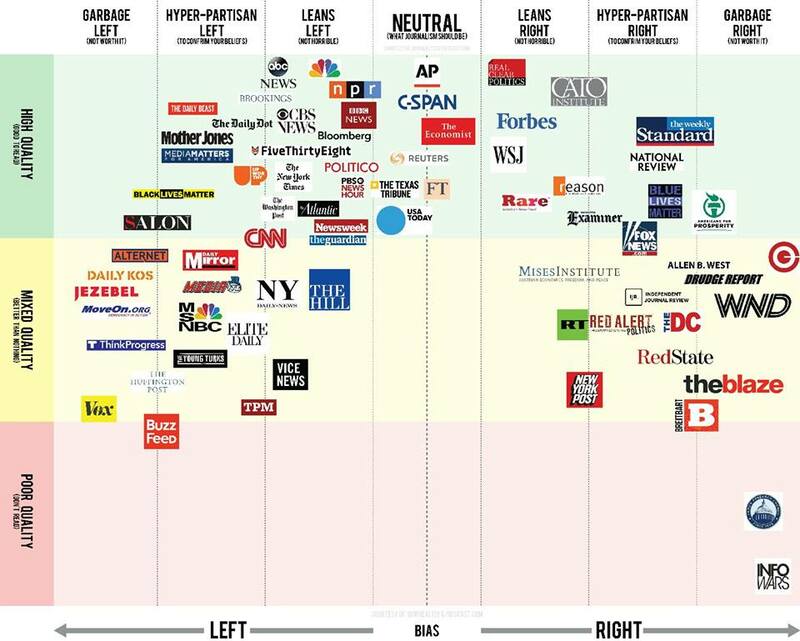 This chart everyone loves is persuasive because it allows us to play into the fantasy that we can see this hidden motives and agendas, expose them, and find the truth in some comfortable middle ground where the facts are. It would be a better strategy to learn the reasoning behind evaluation of good sources and chart which sources are good and bad along those lines rather than to assume that CNN, say, is roughly equal to Fox they are just motivated differently. One very good way to determine the usefulness of a news source is to see if that source prints retractions and corrections. If we do just that one thing, it becomes clear that BUZZFEED is NOT equal to Breitbart. BUZZFEED actually does print retractions and corrections. Breitbart does not -- even when they are grossly wrong. Sorry to burst your middle-ground bubble, but truth is much harder than you think. Reasons matter. Motives and agendas don't matter as much as you might think they do. And dear god, BlueLivesMatter is not roughly equal to Blacklivesmatter. You might have to deal with the fact that things are not equal, that you can't strike and easy balance, that it might be the case that an extreme that you have been trying hard to resist because it makes you uncomfortable might actually have a point. Please look at the reasons for supporting deeply held values and learn that it really is something you can evaluate. Don't fall into the lazy way of thinking that it's political identity and agendas that provide guidelines for determining what to think. Commenting on this Story will be automatically closed on May 8, 2017.